La Toute Premiere with her dam, Start the Rumors. A stud farm of rare coloured horses in Virginia has been enhanced with the arrival of what her breeders say is the world's first thoroughbred dilute frame overo filly. Loudoun breeder Bridget Perry has a collection of rare, coloured horses at her Norsire Farm, tucked away off a rural road west of Hillsboro, Virginia - a collection that was enhanced last week with the arrival of what Parry says is the world's first thoroughbred dilute frame overo filly. She named the filly La Toute Premiere, in French meaning, "The First Ever." 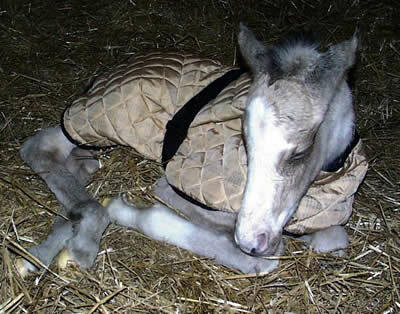 The new Buckskin arrival, who lay contentedly on the hay at her mother's feet in a stall at Norsire Farm last week, was reported to the American Jockey Club immediately after her birth at 10.45pm on February 23, as well as to the American Paint Horse Association. It's a rarified and complicated world, with words like single or double dilutes, Frame Overo, Sabino, Palomino, Dilute, Sabino Overo, Cremello, Buckskin and Pinto. La Toute Premiere's sire and dam; sire Zillionair at top; and dam Start the Rumors at bottom and below. Both are fully US JC (Jockey Club) registered thoroughbreds. La Toute Premiere's dam, Start the Rumors, is a Thoroughbred Frame Overo, distinguished by a big white splotch on the belly of her otherwise all-over brown colour. She munched lazily as her offspring dozed, probably relieved the 11-month pregnancy was over. 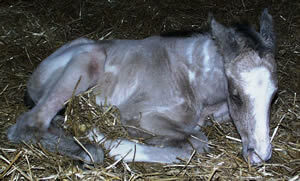 The bay frame mare was bred March 20, 2005, to Norsire Farm's stallion Zillionair, a rare double dilute cream. "That's how we got the single dilute for the buckskin," Perry explained this week, adding that the frame variation of an overo is the hardest to get. Perry immediately sent off a DNA sample to be tested at the Animal Genetics Laboratory in Tallahassee, Florida, which last week confirmed to an elated Perry the newborn was indeed a dilute frame overo filly. The Florida laboratory is a leader in DNA analysis for birds and horses. Since its inception in 1992, it has become the largest provider of genetic tests for birds and horses in the country and around the world. Laboratory representative Ed Dekloet said DNA for horses is important to breeders for coat color and genetic defect testing. With DNA, breeders can increase their chances of coming up with a unique color combination. "With DNA, you've got one part from the mother and one part from the father," Dekloet said. If you know the exact mix of the equine parents' DNA, there's a whole new brave world of mix and match out there, including a listing of possibilities. "You can type in a certain dilution and it shows percentages of what's possible," Dekloet said. His brother, Rolf Dekloet, explained that mixing of different genes causes dilutions, such as the cream dilution that comes out in a Buckskin, Cremello or Palomino. 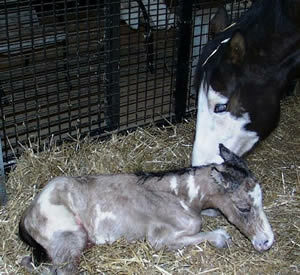 The lab can test for Lethal White Overo, in which foals can be born dead, or a muscular disease known as Hyperkalemic Periodic Paralysis Disease. 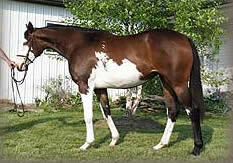 It can test for different coat patterns, or to determine a horse's base coat colour for different colour pigments. Most importantly, for Perry, it can test for the cream dilution. It is responsible for the dilution of Chestnut horses to a Palomino or a Cremello. A single dilution will produce a Palomino, a double dilution a Cremello. A dilution of a bay horse will produce a Buckskin or a Perlino, which is a double dilution of a bay. Breeding a frame overo with a horse possessing the cream dilution is for those aiming to produce the dilute version. 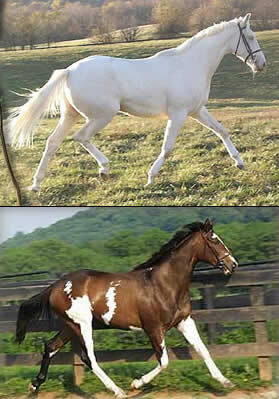 Overo refers to the different white spotting parts on a horse, of which frame overo is one - so called because the white spotting parts are outlined against the body of the horse. The dizzying mix of colours and how they are produced is complicated to the uninitiated, who can feel they have stumbled into some rare and alien environment as the knowledgeable rattle off the different colour genes and ways in which the colours can be manipulated and developed. It's a bit like mixing paint colors on a palette - whether you breed a double dilute or a single dilute and to which base colour horse. While the words trip on the average person's tongue, Perry rattles them off with ease, patiently explaining the process by which the rare colours are developed through careful breeding programmes. The filly represents Perry's first attempt at producing a dilute frame overo. Perry has had horses since she was 8. She attended high school in Sterling and remembers boarding her horse in Ashburn, "when it was still country." She started breeding in 1985, on 10 acres in Lovettsville. She moved to Hillsboro to a larger, 30-acre farm in 1999. Now 42, she is also a Realtor with REMAX Renaissance. The reason Perry says she knows she has produced the world's first dilute frame overo is because there are so few white horses in the world. Breeders of colour dilutions live in a rarified world, in which each knows what the other is striving - and competing - for. The dilute Thoroughbred Palominos and Buckskins are very rare. "There are only two lines," she said. "There are no others." Rick Bailey at the American Jockey Club confirmed the filly's arrival, which was reported to him on February 24. The registering process at the Jockey Club starts with the "live foal report" which includes photographs of the new colt or filly. The club only has a "limited number of colours, of which white is one," Bailey explained, adding the club does not further distinguish the breeding characteristics. La Toute Premiere is one of about 37,500 to be registered this year. Bailey said that tally includes Thoroughbreds in the US, Canada and Puerto Rico. The numbers fluctuate periodically, he said, noting "back in the mid-1980s we were registering over 50,000 horses." Perry does not plan to sell her new filly. Rather, she will become a stellar member of the farm's breeding programme. Perry knows that with a double dilute filly, she is guaranteed to get either double or single dilutes of Buckskins, Cremellos, Palominos or a Perlino. It's a profitable business. "I sell out every colour, usually before the mother is weaned, or it's in utero," she said. People who love rare colours will buy from all around the world, she said. She once sold one Cremello for $50,000. She is asking for $25,000 for another Cremello in utero. Plain Palominos go for about $15,000 and Buckskins go for $15,000 and up. The filly is among several rare outcomes Perry has achieved, or hopes to achieve. Norsire Farm also has the only all-white Palomino stallion, Pure White Gold, registered with the Jockey Club in 2002. The colt was the first and only born in Virginia and only the 17th ever registered with the Jockey Club since it began keeping records in 1894. The farm also has an imported Australian mare, Our White Lady, who was the first white horse of any breed ever born in the southern hemisphere, according to Perry. First destined to be a movie horse in a deal that fell through, Our White Lady then tried racing. That effort failed also, because of lack of training. Track officials banned her from training during regular morning hours because her all-white appearance spooked other horses, according to Perry. Finally, she made it to Loudoun, where Perry still maintains the long mane desired by the movie company, although, with apologies to her former Australian owner, she says she uses horse shampoo, not the delicate human shampoo her previous owner used. Our White Lady is in foal, due this May, and Perry said she hopes to get a second all-white Palomino. This week, Parry was carefully watching the filly's faltering first steps.